There are a host of alternative treatments available for migraine. One treatment, reflexology for migraine, is gaining more attention as people look outside of traditional medicine for help. But does it really help? And if so, why? Treatment of the feet for non-foot related diseases may go back hundreds, even thousands of years. But reflexology (usually though not always focused on the feet) is a relatively new concept, and reflexology for migraine is even newer. It was in the early 1900s that Russian neurologist and psychiatrist Vladimir Bekterev investigated how internal systems respond to outside stimuli. US doctor William Fitzgerald and his colleague Dr. Joe Shelby Riley also investigated zone therapy for treating pain. But it was really physiotherapist Eunice Ingham that developed and popularized reflexology through the 30s, 40s and 50s. The basic idea is that certain zones on the body (ie the feet) can be used to influence and improve the functioning of the nervous system and organs in the body. Ingham developed her theory by testing hundreds of patients and developing charts of these zones. Reflexology usually focuses on the feet, but sometimes the head, hands, and even ears. Reflexology has a long history of pain treatment, and so has been tried for various types of headaches. Migraine is more complex that a simple headache, or simply pain. However, since reflexology attempts to treat the body and not the symptoms, some are enthusiastic about it's value for migraine, both as a preventative and abortive treatment. Reflexology - a lack of information? Although reflexology has become a common term, we have less information than you might think regarding how effective it is, especially when it comes to reflexology for migraine. Part of the problem is the failure to compare reflexology to massage and mayofacial trigger point therapy, for example. How effective is it as compared the acupressure? Self foot massage? We need more answers. 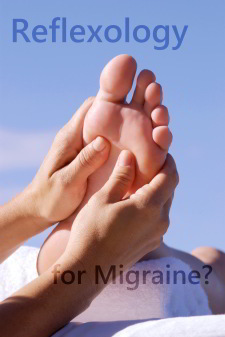 Perhaps the best known study of reflexology for migraine was done in the mid-90s in Denmark. 220 patients were in the trial, and 16% saw drastic improvement of their symptoms. 65% believed that reflexology had been some help. There are a few problems with this study, however. For one, it's very unspecific. How much improvement was there? Also, the study was for those with migraine and tension type headaches, and you have to wonder exactly who had what and who was helped the most. Also, and this might be the key problem - how would a simple self foot massage compare? More information on reflexology for migraine studies. Studies on reflexology have been mixed. Read here, for example, about a study that showed foot massage to be better than reflexology for one set of patients. In the end, any foot massage may help. In fact, maybe it's better to buy a quality foot roller than to shell out the bucks for many treatments of reflexology. Reflexology suffers from a lack of standardization, and a lack of study. There's good evidence that reflexology may help with pain, and also that it may help with relaxation and body functioning. An improvement in sleep alone may make reflexology worth it for migraineurs. But we don't see convincing evidence that it's better than other types of massage. It would be helpful to see more studies comparing reflexology with a placebo - in other words, with other types of foot massage - for migraine. Meanwhile, it seems that foot massage in general is a very good idea for migraineurs. It's good to see more interest in whole body natural treatments for migraine. Massage is excellent treatment, as is treating of pressure points. Reflexology may help people suffering from migraine, but it's not the first place most migraineurs will choose to spend their money.